VR-282 - Very unusual Dwarf Vienna Regulator timepiece by A. Maur, Linz. Claterbos lists only one Maur, a Carl, with the rather cryptic note 18/II. I suspect that the manuscript listing Carl was badly enough worn or tattered that all that could be deciphered was that Carl had a shop at an address with an 18 in it, in the second district of Vienna. None the less, no A. Maur is listed, which is not surprising, since Austrian makers from outside of Vienna are not typically listed in any reference book. And, while there is a bit more of the first name visible, I hesitate to guess that the name is Alois, though that is all I can guess to fit what I see. 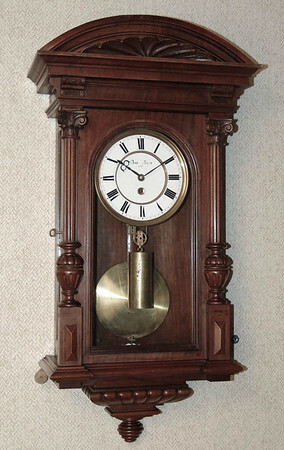 I describe this little gem as very usual both because of its very short and wide stature (27 long, 14 wide) but also because, with a weight drop of only 5 inches, this clock runs a week. In fact, the mechanism should really be thought of in the same class as a month-running Viennese mechanism, because it does in fact wind backwards to typical Vienna Regulators, and has the extra gear between the winding drum and the minute arbor to allow it to achieve a weeks duration with such a very short drop. What you have is a miniature month-duration mechanism! In fact, in a standard sized case, with typically 20 plus inches of drop, this mechanism would run a month. We find this mechanism in a very nice, original condition case that has been cleaned, waxed, and is ready to hang. Everything about this piece points to a very high quality maker - the exceptional carving to the top, bottom, and door columns, the very unusual base treatment, the lovely detail to the moldings just above the columns, the key’d door lock... And, it really is in lovely condition, with all old glass, a perfect dial with no hairlines, the name, while not perfect, still very lovely, the original wall stabilizers, and beat scale, which is oh so cute and small, and serviceable, though it has a number of fine hairlines which I suspect would virtually disappear when cleaned. Oh, I forgot to mention the wonderfully small, perfect for the clock, engraved pulley. This clock epitomizes the difficult position in which the Austrian makers found themselves in the latter part of the 1800's: Beset by inexpensive, lower-quality imports (primarily from Germany and America) the Austrians continued to produce the phenomenal quality for which they were famous, all the while seeing their business shrinking because they could not lessen their standards. While a first glance might tempt you to pass this piece up, I believe this clock deserves to go to a collector who has the sophistication to recognize a truly wonderful and rare piece.